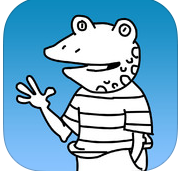 MakeBeliefsComix.com is a free web-based application or iOS iPad app comic creator (free version and Ad-free version ($1.99). Choose from a nice selection of characters/character views, props, and backgrounds to create 2, 3, or 4 panel comic strips. 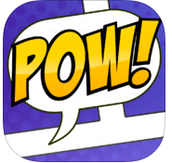 Add speech bubbles, thought balloons, or panel prompts for text. When the comic is created, you can email it or print it from a computer, or save it to the camera roll on an iPad. Most of the comics are not in color, but a colored background can be chosen. Use the "Getting Started" or "Menu Help" buttons for instructions. See two samples below. Strip Designer ($2.99) is an iOS app. Images from your device's camera roll can be used with customizable captions, speech bubbles, stickers, titles, etc. in a wide variety of layouts. In addition to creating "comics," this app is a good way to showcase work, show step-by-step instructions, create posters, annotate photos, and more. Images can be emailed, printed, inserted into other apps, uploaded to Dropbox and Google Drive, used in iMovies, and more. See a sample below.